RULES AND SCORING SHEETS ARE POSTED. SCROLL DOWN FOR NEW DOCUMENTS. Team Info Sheets, Maps, Rules, Scoring Sheets, Worksheets, Rulers and more. HOT NEW ITEMS FOR 2008! 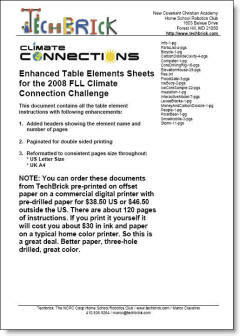 Worksheets for the Climate Connections Challenge and Cool Group games for communications. 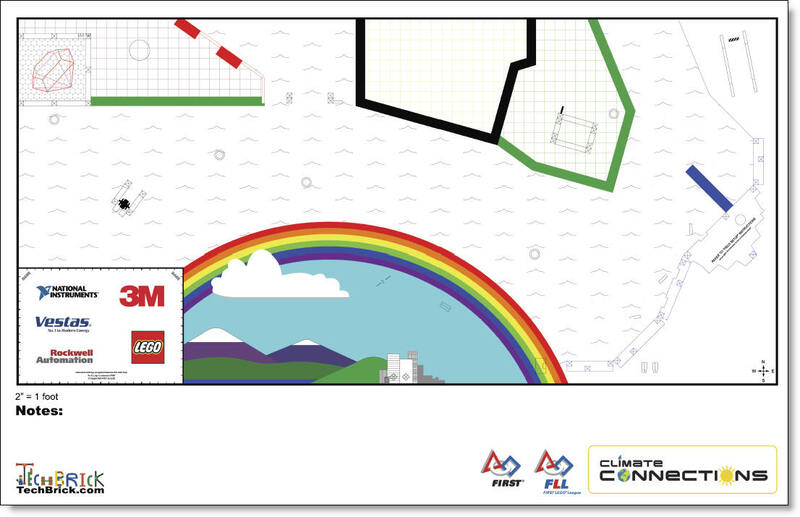 FLASH: There are secret messages and Easter egg on the new FLL challenge mat. Download the mat image below and scrutinize it. It's there! NEW! What is a Team Info Sheet? Terry Stevens asked: "The Coaches Manual refers to a Team Introduction Page to be used at the tournaments. I have searched high and low but can't find it. Do you guys have one ? Thanks, Terry"
As you can see, there can be up to three of these (Tech, Teamwork, and Presentation). 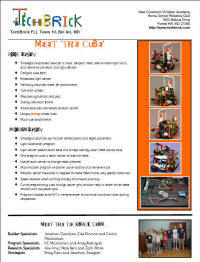 We've included some samples of our previous team info sheets. Some are form-based, others of our own design. Remember, in most tournaments the judges may see 10-20 teams. 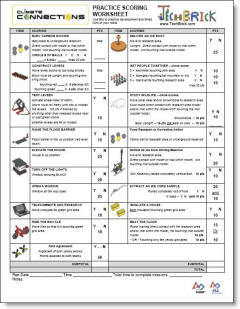 A good info sheet provides a reminder for them when it gets down to final scoring. Some sample sheets from the past few years. Be concise, be creative, be clear. Make sure you have good photos. 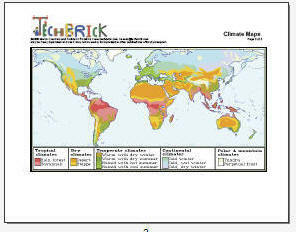 We searched Google Images for 'world climate map' and found a number of global climate schemes. We used these three maps with different classifications to generate a lot of conversation about climate and the unexpected parallel climate areas. For example: Who knew that Maryland has a similar climate to eastern New Zealand? ROAD TRIP! We've compiled all the various documents for the challenge into one nicely formatted document of 23 pages. THIS IS ESSENTIAL INFORMATION AND SHOULD BE READ AND RE-READ BY EVERY MENTOR AND TEAM MEMBER. YOUR SUCCESS IS ALMOST ENTIRELY DEPENDENT ON YOUR COMPREHENSION OF THIS INFORMATION. Don't forget to consider ordering your pre-printed assembly instructions! NEW! Updated to reflect the latest FAQs 9/12/2008! It is essential that you start early in your work to try timed and scored runs. Even if you only have a few missions done you should still practice them. You have 150 seconds to complete the missions and work towards the gold standard of 400 points. Corrected 9/10 with suggestions from Doede ten Cate (Netherlands FLL/FTC) and Joshua Heinzl of the New England Robotics Designers. These spreadsheets are available for free use. After clicking a file link, choose Save to save a copy to your hard disk and open it from there (choosing Open may not work). Contact whrc@tappoint.com to report problems or suggestions. 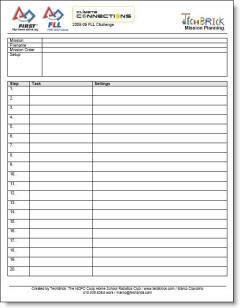 The Scoring Sheet in Adobe Reader (pdf) format is designed to be printed out. Have the team members use it electronically to compute their scores. Print or Save-As selected runs as desired. Close without saving to keep the original sheet blank, or save-over each run to help highlight differences between runs when filling out. Print it out and use it as a pencil and paper worksheet to record completed items from a run, then calculate the score later using the electronic version. Visit http://www.tappoint.com/robotics/scoring for more info. Right click here and choose "Save Target As..." to download the ruler PDF. It is paginated for double-sided printing. Why print these yourself? It will cost you at least $30 (really). Instead, scroll down and order a copy printed on great paper, pre-drilled, in beautiful color. Answer: The field kits begin to ship in early August each year. Most registered teams should have received their field kit and mat by this time. In the field kit box (with all the pieces) is a DVD with the assembly instructions. Keep in mind, this only shows you how to build the elements in preparation for the challenge release on Sept 5. On Sept 5 around noon ET the full challenge will be released with details on the table challenge and the research project. Kids love to try to figure out the challenges. 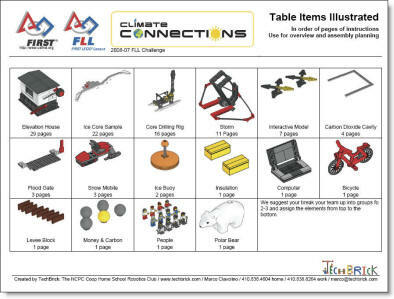 We will be assembling our table elements soon and then sending the kids home with our 3-page strategy worksheet to have them think through the possible challenge for our next meeting. 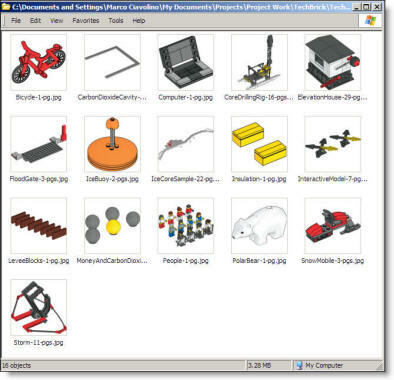 Use these to plan your missions and programming and make assignments during assembly.. Contains a small image of each of the elements. Shows the number of pages of instructions..
We will send this home with our team on our next meeting. Their homework will be to read the challenge (released on Sept 5), write out each task, and come with at least two ideas for each task. Use this in conjunction with the table worksheet. 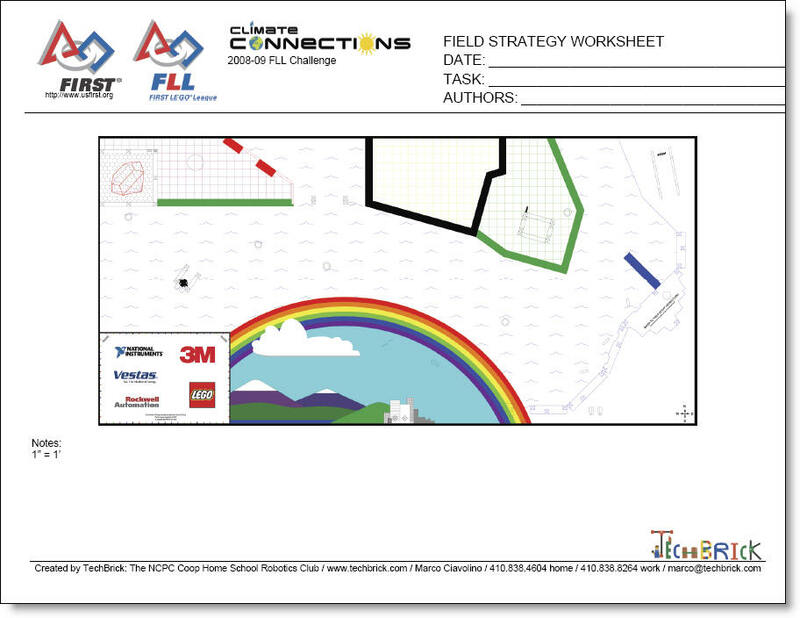 This is a pres-ready PDF in 11 x 17 intended for use as a planning tool with dry markers. Have it output at a vendor like Kinkos. Have mounted and gloss laminated. You can then use dry markers to try different ideas for missions. By popular demand we are providing a hi-res JPG created from original artwork. This document will print well up very large sizes. This zip file includes a 4" wide @300dpi image for each of the table elements. 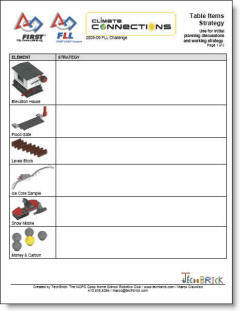 A simple worksheet for mission/programming sequences. 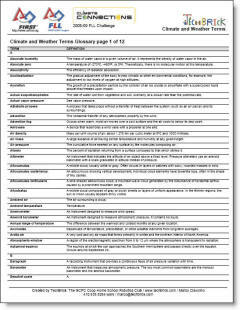 This document contains a huge list of weather terms and definitions.